Announcement FREE SHIPPING with purchase of two (2) or more items. 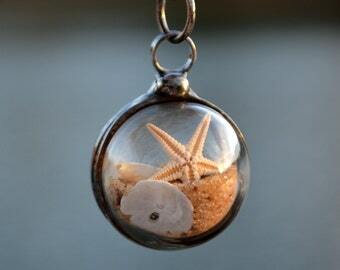 BayouGlassArts ~ Handmade Jewelry made from Unusual and Exceptional Things. Many of my items are available for next business day shipping, others may require 2-3 day turn around. The exception being custom items, which may require up to 1-2 weeks. All items from my shop will arrive securely packaged and I have gift wrapping available at checkout for a nominal fee. If your order is intended as a gift, I'm happy to send the item directly to your recipient. If you like, I will also add a personalized message from you. Simply include all the relevant details and instructions when you check out in the “notes to sender” box. If you need to get it there in a hurry, mailing direct will save you time and money! 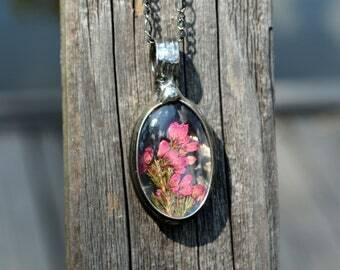 BayouGlassArts specializes in pressed flower jewelry, dandelion seed necklaces, terrarium necklaces, magnifying glass necklaces, shaker necklaces, kaleidoscope necklaces, real ebony piano key necklaces, shaker pendants, gemstone necklaces, and so much more. I make all bails large enough you can change out the neck chain if you would like and all jump rings are soldered closed to secure your jewelry. Handmade in USA. Custom orders and wholesale orders welcome! Please contact me for details. Eco friendly and metal sensitive friendly solder is my medium and each piece of jewelry is handmade by me in my studio on a Louisiana bayou. My work is free hand and organic in style. My use of soft solder technique allows me to create Stained Glass Jewelry, Terrarium Jewelry, Dandelion Seed Necklaces, Piano Key Necklaces & Key Rings, Gemstone Jewelry, Handmade Earrings, Broken China Jewelry, Real Flower Jewelry, Moss Jewelry, Piano Necklaces, Music Necklaces, Magnifier Necklaces, Kaleidoscope Prisms, Raw Quartz Jewelry, Whiskey Bottles and many other exceptional things. The metals I use (copper, sterling, gold filled, rose gold filled, tin, and brass) are metal sensitive friendly, no nickel, no lead, no zinc. Join me on Facebook for updates on new items and discounts. Copy and paste link and then request invite. "Such a cool piece! Funky and functional too! Love the craftsmanship and details put into making the piece so beautiful! The presentation was so wonderful too- arrived gift boxed in an organza bag, and even topped with a bow!" "Beautiful work, shipped quickly and the seller was easy to reach! Overall a pleasant experience." "I love my Second Necklace. My Cousin is going to LOVE it! These are so Artsy and yet so practical at the same time. Customer Service is Excellent as well. Will always be a fan !!!" FREE SHIPPING with purchase of two (2) or more items. I may only be a few states away, but it shipped and delivered in 24 hours, that's just amazing. I've had it take a week to get a package from only one state over. 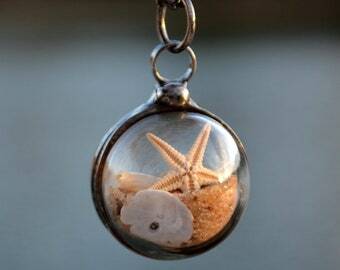 The quality is great too, it's very durable, crystal clear glass. It's a but heavy so I'd probably put it on a more durable cord. My only complaint is that all of the pictures look so pretty with fanned out sprigs, but mine has one very small, clumped together, and offset sprig. 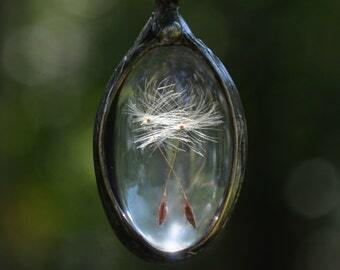 It's pretty, I'm sure it's not the easiest thing to get plants into glass. It's great quality, and it's the meaning that counts the most so I'm sure my mom will love it. This was perfectly beautiful including the chain. It made a wonderful gift. 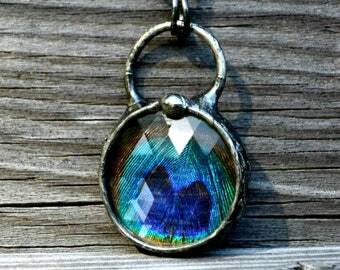 This necklace is so beautiful!! New listing...spring and summer are just around the corner! YAY Daisies! Newest item to my shop. Real dry pressed forget-me-nots. More styles and shapes to come. Lovely way to remind someone. I just love it when customers send me photos wearing/using my jewelry! 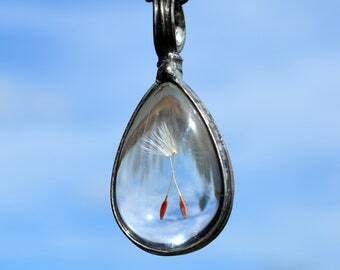 Handmade magnifying glass pendant. Nature walks looking for lovelies to preserve for later use in my terrarium jewelry. Wax on & soon to wax off. 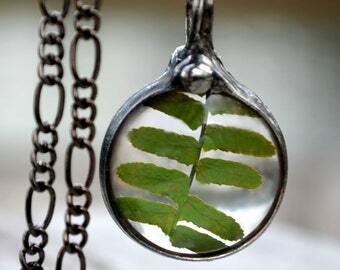 Work in progress of terrarium jewelry, magnifying glass, dandelion seed pendants, and more. Labradorite bracelet. Great for stacking with other bracelets. A walk through the meadow completed. Our Bayou en Louisiane where my home and studio are. Like a magpie, I’m drawn to all things that sparkle. With my background in stained glass... jewelry just happened, I’ve been hooked ever since. My preference is clean lines, lending more to a straightforward and simple design. 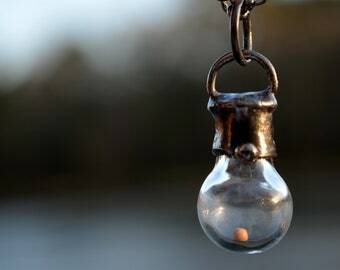 Besides nature's offerings found on my many walks, (wildflowers, moss, dandelion seeds) I also incorporate vintage findings, real feathers, broken china and more recently magnifying glass monocles, hand fired ceramic pieces and leather. I strive to make unique and conversational jewelry. I opened my shop on Etsy in 2010 but didnt really get serious until 2013 when I began working my jewelry full time. The "Tiffany" method of applying copper foil and solder is the process I use in making my jewelry. There is an industrial and organic sense to both the look and feel of my work. I use the highest quality metal sensitive friendly solder (no nickel, no lead). Sterling silver, gold filled, rose gold filled, brass and copper are my jewelry findings of choice and my packaging is thoughtful and secure to assure your purchases arrive safely. Gift wrapping available for minimal charge. My husband, who is a professional illustrator and journal maker, shares a studio with me and we live and work deep in the Louisiana woods. Our old farm house is miles from any neighbor and is surrounded by pine trees. An ancient and alluvial bayou laps at the yard's edge. Our home and studios are in the midst of all this nature and its sweeping forms of sounds, sights and energy. I believe in handmade. I buy handmade and vintage whenever I can and truly feel that by supporting one another we create our own micro-economy of better quality and entrepreneurship. From inception to completion, each piece is handmade by me in my little studio on the bayou. Yes, I offer wholesale. Please contact me for more information and line sheet. 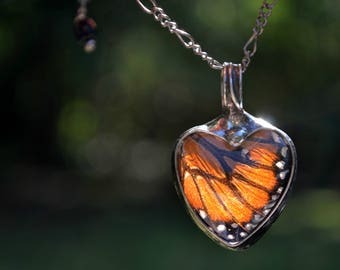 Treat all BayouGlassArts jewelry similar to that of sterling silver. After wearing wipe down with a soft cloth and place in a poly bag for storage. Do not wear in the shower or while swimming. Do not use harsh jewelry cleaners or dips. Is your work resin? 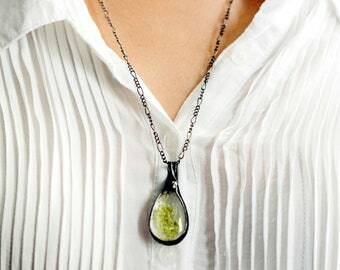 Will my pendant turn yellow or change colors? 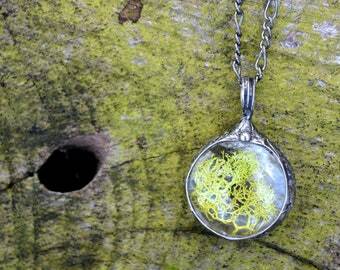 No, all of my flower, dandelion seeds and other terrarium glass pendants will not turn yellow. 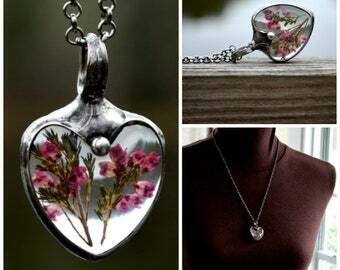 The items are encased in glass and not resin. The glass will not change colors. Can I order a custom chain? I offer several lengths with each item but if you do not see the size you would like, just leave desired length in the "notes to seller" at checkout. With BayouGlassArts, customer satisfaction is guaranteed. If you for any reason are not happy with your purchase, please contact me immediately. Once I know you are wanting to return your item I will send you the return address. Please send in condition received and once it arrives, I will refund your purchase price. Cost of shipping will be buyers responsibility. Does your metal contain nickel or lead? No. The solder I use is eco-friendly and metal sensitive friendly. Silver, copper & tin. Please send me a message and I will be happy to work with you on custom orders or wholesale orders. Each of my packages are wrapped safely and thoughtfully. Gift wrapping can be requested for a minimal fee during checkout. Should you like to have your order sent directly as a gift, I will be happy to add a note/sentiment in your name. You can make this request also during checkout. Yes, all International orders will be shipped 1st Class International including insurance. If you prefer expedited shipping, please contact me for additional rates. There are some locations that I reserve the right to request additional shipping to cover tracking due to prior issues with delivery. Do you collect VAT or GST on International orders? No, the buyer is responsible for any customs charges, import fees, VAT (value added tax) or GST (goods and services tax). I am not authorized to collect a tax for international orders.